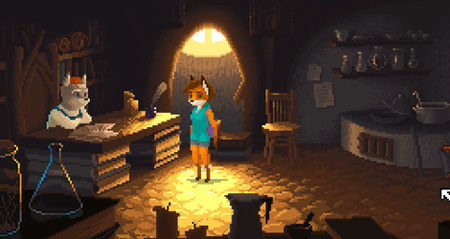 FoxTail is a classic point-and-click quest by Gingertips Game Studio. It brings you an interesting plot, beautiful graphics and an atmosphere of mystery and adventure. The game is about a cute, young fox named Leah who goes on a journey to find a cure for her grandmother. Along her life changing trip she explores forests, swamps and caves, gets acquainted with various creatures and helps them in their needs. She also reveals the secrets of her grandfather’s mystical past. Leah the fox is charismatic, funny and cunning, as any fox is supposed to be. She will have a long and difficult journey: through the labyrinths of mines, mountains, swamps and dangerous forest at night, defeating her own fears and helping those who meet her on the way. If you get stuck in the game, check out the video walkthrough and gameplay for the game. This entry was posted in PC Games, Walkthrough and tagged FoxTail Cheats, FoxTail Gameplay, FoxTail Guide, FoxTail Hints, FoxTail Review, FoxTail Solutions, FoxTail Strategy, FoxTail Tips, FoxTail Walkthrough by Marvin. Bookmark the permalink.